Oh this question! It’s such a tricky one to answer. It’s somewhat similar, but much more difficult than “What’s your current salary?” which you’ll also probably be asked. It’s completely okay to expect that your future salary will be more than what you’re making today if you are moving into a role that builds upon your current experience (not entry level or a total career/industry change). Companies know that compensation is one of the factors that drive people to switch jobs, and so most of the time they will consider your current salary and plan to make an offer that is above it. If the role you’re interviewing for is a level up from your current role you can expect a bigger increase than if it is a lateral move (same level role, just a different company). With that in mind, don’t set your salary expectation below what you’re currently making unless you are taking a step back in scope or level. If the company can’t accommodate to that they’ll explain it and get your thoughts. My other big piece of advice here is to take into account all aspects of your compensation, not just base salary. Vacation days, bonus opportunities, benefits, and hours worked relative to pay are all good things to consider. Figure out your actual expectations (obvious, I know!) Most people have a number in mind that they are looking for when job searching and shouldn’t be afraid to say it. The worst case scenario is being taken out of the process because of a too-high expectation… but if it’s really the amount you require in order to accept the job then I think it’s better to not waste your time and energy to begin with. Many people say to me, “well I don’t know what I really want” and if you’re in that camp, hop down to the next paragraph. When searching on Glassdoor, you may find data for the exact role at the exact company you’re interviewing with (rare, but possible especially with bigger companies) and if not, you’ll likely find salary data from competitors which is also helpful. 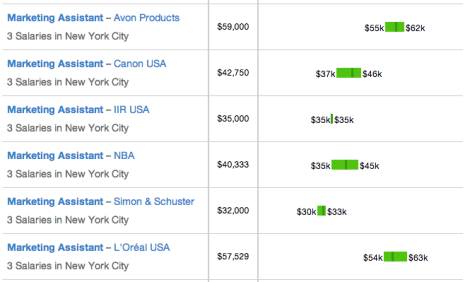 Below is a sample search I did for a “Marketing Assistant” role in NYC. You can see that salaries greatly differ by industry, with the consumer products companies paying substantially more than some of the other industries. With that in mind, make sure you are looking at data for roles that are similar in scope and industry to the one you’re interviewing for. Take your current compensation, your actual expectation, and the market knowledge you’ve gained, and come up with a number or range to share. In my experience recruiting, if someone’s expectation is really out of whack with the budget for a role, I would simply have a conversation with them explaining that and then asking them if they still want to move forward. 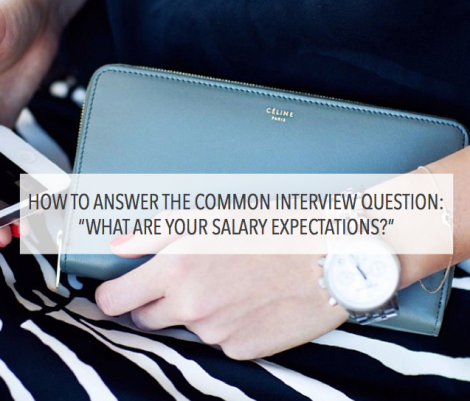 When you share your salary expectations, feel free to let the person you’re speaking with know that you also care about finding your way into a great company in a role that you’re excited about. I feel like that helps make the conversation a little more balanced. Hope this post helped you come up with an answer to this tricky question – good luck! Common Interview Questions: Where do you see yourself in 5 years?